This recipe is the outcome of substitution and experimentation with ingredients to alter a recipe to fit my needs...and the outcome--if I do say so myself--is outstanding. But as usual I'm jumping ahead; let me begin again. Next week I'll be serving a cocktail party showcasing the heirloom tomatoes from Tom Towers Farm. He gave me a beautiful sample pack today of many of his incredibly lovely tomatoes and I plan on turning them into many delicious finger foods. Sure, I'll do some of the obvious--gazpacho, BBQ sauce, pizzas, homemade ketchup for frites--but I also wanted do to something a bit different, in a kitschy sort of way...hence this recipe. This is based on the popular snack food, Cheez-It. 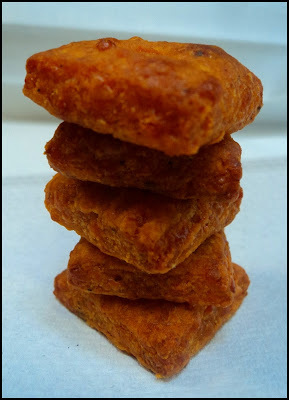 There are plenty of recipes floating around the Internet for this tasty little cracker so I chose a few, combined them, changed the ingredients, and this is the outcome. The basic recipe is really nothing more than a basic savory short dough that is loaded with cheese. But in this recipe I replaced the water (just a couple tablespoons) with fresh pureed tomato (about 3 times the amount of the water due to its pulp), and instead of dry mustard in the original recipe I spiked it with Cajun seasoning, giving the cracker a bit of a zip. The result was/is delicious...I couldn't stop eating them. They'll go great with cocktails (which of course is the intention). Anyhow, they are really easy to make; here's a few photos and the recipe. 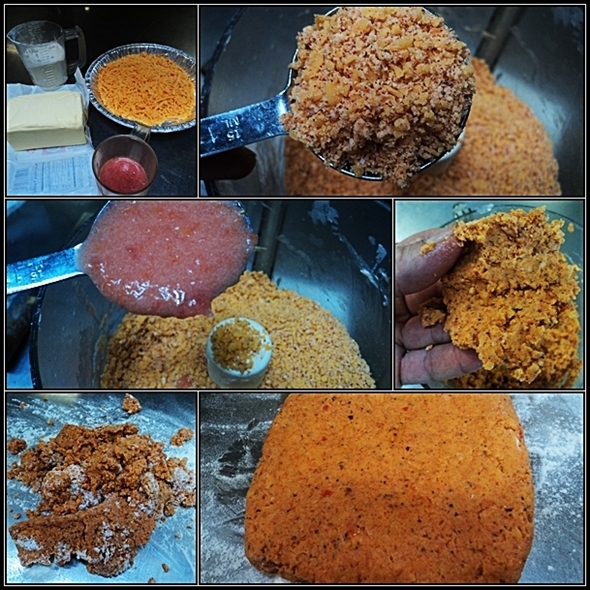 Puree the tomato in a blender and set aside. Combine the flour, butter, cheese, Cajun seasoning, and salt in the bowl of a food processor, and process for a minute or two, until it resembles course cornmeal. Add 4-6 tablespoons of the tomato puree and run the processor for just about 15 seconds, or until the ingredients form a rough dough. Turn the dough onto a lightly floured work surface and knead it for about 30 seconds. Shape the dough into a square disc, wrap it in plastic, and refrigerate it for about 20 minutes. Preheat an oven to 350F, then roll the dough out until it is a square measuring approximately 10-inches by 10-inches and 1/4-inch thick. Cut the dough into 1-inch squares, and using chopstick or other small dowel, poke an indentation in the center of each square. Place the crackers at least 1/2-inch apart on a baking sheet that is lined with parchment paper. 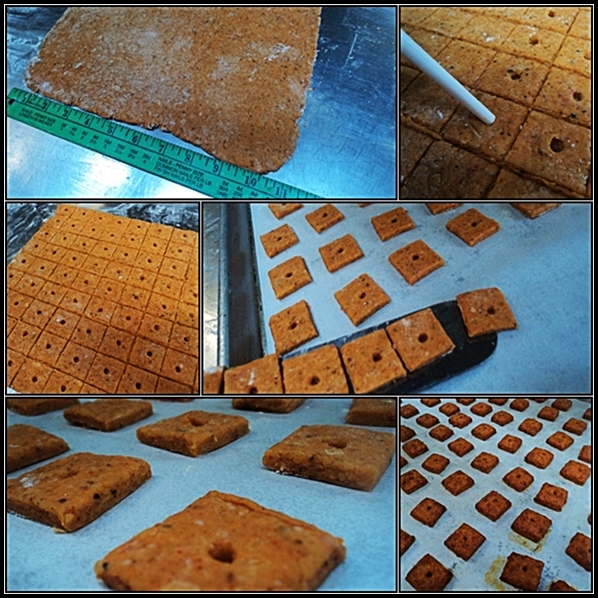 Bake the crackers for 10-12 minutes, or until lightly browned and cooked throughout. Allow them to cool thoroughly before serving.